Renewable alternative -Wind Farm in England. I wrote the piece below the line three years ago, and divestment drifted for a while, despite the big shots supporting it, such as the governor of the Bank of England, Mark Carney. Then, in December 2017 New York and New York State resolved to pull their massive pension fund investments from oil and gas companies. The state’s pension fund is around $200 bn, making it one of the twenty largest pools of money on Earth. New York City’s pension funds come to $190 bn—that’s in the top twenty, too. Then New York City Mayor Bill de Blasio announced a lawsuit against some of the biggest oil and gas corporations for the damage caused by climate change. Norway’s state oil fund, one of the largest pots of money in the world, is looking to divest from oil and gas. France announced it would ban any new oil and gas exploration anywhere on its territory. And the World Bank, a bastion of global capitalism, announced it would cease financing oil and gas exploration within two years. The Church of England – safe, dependable, peaceful, caring. And now radical? A small earthquake was detonated in the Diocese of Oxford, covering the three largely rural counties of Berkshire, Buckinghamshire and Oxfordshire. And it wasn’t set off by fracking. Quite the opposite. Last weekend something remarkable happened, in the name of the 55,000 church-goers in the 815 churches, many of them in pretty and ancient villages and market towns, around some larger conurbations. The diocesan governing body, the synod, voted to go fossil free. Oxford is the first Church of England diocese to pledge to move its investments from fossil fuels. In addition to removing its own holdings, it called upon the entire Church of England to disinvest from fossil fuel companies. The successful resolution in the Oxford diocese is significant because it comes from an institution which is not exactly known for reckless, intemperate action. I live in the diocese and I wouldn’t describe the C of E congregations I’ve known as actively political, although they do note the woes of the world every week in prayer. By definition, the regular rural worshippers the three counties of the diocese will tend to be to the right of the political spectrum. And I doubt if the large number who arrive at Sunday morning services by car are the sort who would have mandated their diocesan representative to go away and sell the shares held on their behalf, had they really thought about it. The activists in the diocese, the representatives to synod, on the other hand, seem to know exactly what they were doing. Revd Darrell Hannah, who proposed the motion, said the vote (52 in favour, with 37 against and seven abstentions) followed “a vigorous debate in which contrasting views were expressed, with good points on both sides. Darrell Hannah, rector of All Saints parish church, Ascot Heath, is on the board of Operation Noah, an ecumenical Christian charity confronting the challenge of the “growing threat of catastrophic climate change”. His motion called for disinvestment from coal and tar sands ‘at the earliest opportunity’, from oil in three years, and from natural gas in five years, and to explore opportunities for reinvestment in clean energy alternatives. In ending its holdings in fossil fuels, the diocese is ahead of all the main political parties except possibly the Greens. Worldwide, the divestments movement has been growing rapidly over the past two years. Earlier this year the British Medical Association (BMA) voted to stop investing in oil, gas and coal on the grounds that their use is a major contributor to ill-health. In September the US Rockefeller Bros fund, founded on oil, also made the decision to take their funds from fossil fuels and reinvest in renewables, as continuing use of oil and gas is contributing to climate change. Also in September Oxford City Council became the first UK council to commit to divest from fossil fuel companies. It has been followed by bodies as varied as Glasgow University and the Swedish city of Örebro. Fossil-free Churches and faith communities around the world include the World Council of Churches, the Church of Sweden, the Quakers in Britain, the Presbyterian Church in New Zealand and the United Church of Christ in the US. These various bodies invest money in the hitherto very solid fossil fuel industry either directly, or through the pension funds of their employees. The holdings are very often small, no more than a few percent of total holdings (although the Church of England still has a reported £60 million invested in fossil fuel companies). and there is no real evidence yet that divesting has driven down oil and gas and coal companies’ share prices, still less forced companies to rein in prospecting for new reserves and future investment. What might concern the fossil fuel industry however, is the speed with which the movement is growing, and the calibre of its supporters. In October 2013 a study by Oxford University said the campaign to persuade investors to take their money out of the fossil fuel sector was already growing faster than any previous divestment campaign and could cause significant damage to coal, oil and gas companies. The churches and other public and academic bodies back disinvestment primarily on ethical grounds, because the fossil burning of fossil fuels contributes directly to Climate Change. Bishop Desmond Tutu described divestment as a “moral movement”. But doubts must be growing even in the minds of those looking at fossil fuels dispassionately, as a sound investment. UN Secretary-General Ban Ki-moon has also called for investors to ditch fossil fuel assets in the light of the latest scientific warnings that the world only has a short time to tackle avoidable climate change. 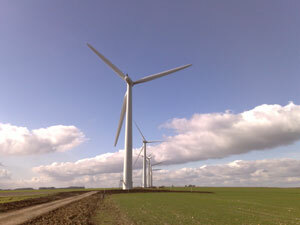 In September (2014) Bank of England Governor Mark Carney warned that fossil fuel companies cannot burn all of their reserves if the world is to avoid catastrophic climate change, and called for investors to consider the long-term impacts of their decisions.Renewable alternative -Wind Farm in England. Carney was supporting the “carbon bubble” theory, which warns that fossil fuel assets, such as coal, oil and gas, could be significantly devalued if governments reach a global deal to tackle climate change in Paris in late 2015.